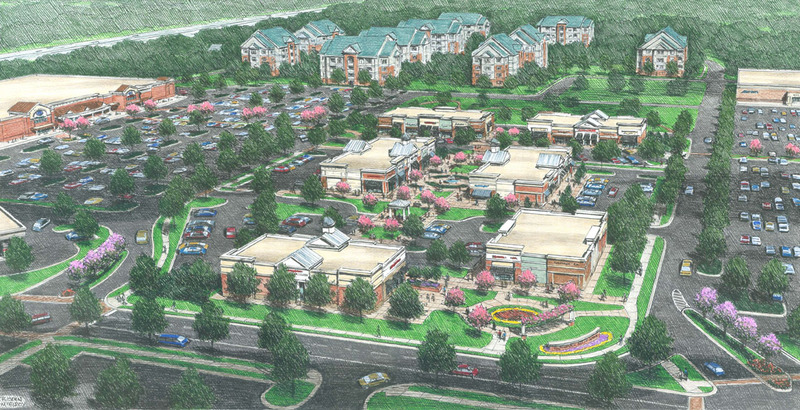 CHESTERFIELD COUNTY, VA – Charlotte-based Crosland Southeast in partnership with Hartford-based Hutensky Capital Partners, the developer of Stonebridge, and Virginia Beach-based Boyd Homes announce that they have reached an agreement to build a 600 unit urban style apartment complex in Stonebridge. The project will consist of studio, one and two bedroom apartments in four buildings. The buildings will feature amenities and balconies located in an open interior courtyard and are designed to integrate into Stonebridge to allow for pedestrian movement to the retail, entertainment and office uses of the development. The project is currently being designed and is expected to break ground in summer for occupancy in mid-2014. Stonebridge is the redevelopment of the vacant Cloverleaf Mall and is an 83-acre, 400,000-square-foot, $100 million mixed-use project in one of Chesterfield’s key retail/business corridors. The project is currently home to Kroger’s largest store in the mid-Atlantic region, a 123,600-square-foot Kroger Marketplace, which opened in December to rave reviews and record sales. Another 27,000 square feet of retail is under construction. Through its acquisition of Crosland’s Retail Development division in 2011, Crosland Southeast and its partners have a long history of developing and leasing award winning retail and mixed-use developments throughout seven southeastern states. The five Crosland Southeast partners previously served as officers of the 74-year old Crosland legacy company, and have a combined 115 years experience in the shopping center industry. Today, Crosland Southeast perpetuates the excellence of the legacy company with its emphasis on retail acquisitions, advisory services, single-tenant development and the development of high-quality retail and mixed-use projects from Nashville, Tenn. to Jacksonville, N.C. The team is currently developing such projects as Stonebridge in Richmond, Va, which was named Virginia’s Best Public/Private Partnership of 2012 by the Virginia Business publication, the final phase to the 260-acre Blakeney development in South Charlotte and a very active single-tenant build-to-suit pipeline. During their tenure, the team has developed over 24 million square feet of retail space. Notable past developments include The Shops at Greenridge in Greenville, SC, Biltmore Park Town Square in Asheville, NC, Providence Marketplace in Nashville, TN, and Birkdale Village and Blakeney in Charlotte, NC. For more information, visit www.croslandsoutheast.com. Hutensky Capital Partners (“HCP”) is a real estate fund manager that invests in retail and mixed-use retail real estate through joint ventures, direct acquisitions, and loans. HCP is currently investing Hutensky Capital Partners II, L.P., a fully discretionary institutional fund with over $100 Million in equity under management. HCP combines an experienced investment team with a hands-on operating affiliate, The Hutensky Group, which since 1979, has been active as both a developer and redeveloper of retail assets throughout the country. THG has been involved in more than 150 retail properties in 28 states representing more than 25 million square feet as owner, developer, manager, leasing agent and/or advisor.